I can’t imagine we have much in common, her majesty and I. Other than being British. What with me being a commoner and Catholic and all. My sister’s called Elizabeth – that’s a kind of connection. Tenuous, I know. But there is one more thing. And on Sunday I hear it calling. It’s the first jaunt for our new, slightly used car. We haven’t christened her yet – but she’s definitely not a Jezebel. More a Snow Queen – but that’s not a great nickname, is it? Turning children’s hearts to ice? I don’t think so. I can’t tell you how far we travel – we’re too busy checking the miles per gallon. Impressive – and it keeps on getting better. Passing over the first cattle grid, the car glides to a lonely halt in a parking place with a view. It takes us about three steps to realise the path heading downwards might just as well be a chute into a bog. It’s been raining so much the peaty ground’s saturated. Across the road the drier path heads upwards. Steeply. But I have walking poles for such challenges and soon we’re huffing and puffing at the top. 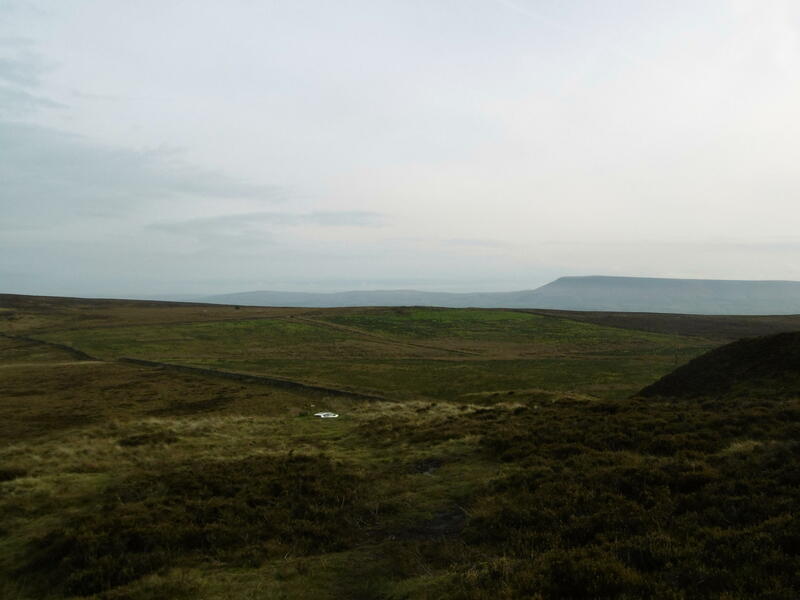 The blunt contours of Pendle, the Lancashire witches’ hill, are dark against the skyline. The moors dip and rise. The heather is scrubby, drained of its autumn colour, the purple whinberries long ago scoffed by nibbling sheep. 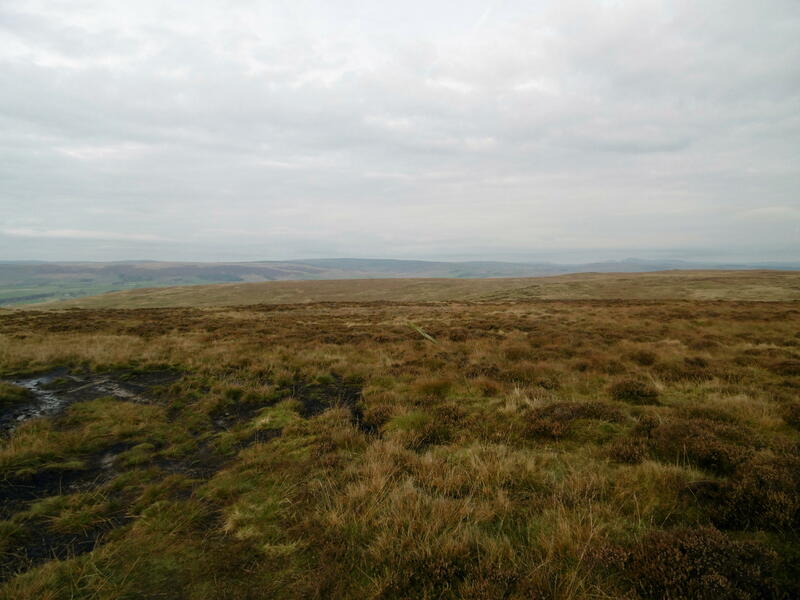 This is the edge of the Forest of Bowland. Officially an ‘Area of Outstanding Natural Beauty’, it’s not ‘forest’ in the sense of woodland, but an area once outside the law – from the Latin, foris, outside – a term dating back to medieval times. The Kings of England used the designation, ‘Forest’ to deter development and protect the habitats of their favourite hunting grounds. A grouse, startled, rises into the air. It’s the only living thing, bar us, in sight. Our usual goal here’s a tea van, set by a babbling brook. If the weather’s good and the time of year right, it’ll be there, nestling in a valley surrounded by grouse moors and sheep-grazing hills. We’ll have mugs of strong tea and Chorley cakes – round slabs of pastry spotted with currants, not to be confused with buttery, currant-stuffed Eccles cakes. Chorley cakes are real walkers’ stodge (or very guilty treats). Today we’re feasting on a different, upland view – and magnificent though it is, it’s also bitterly cold. The wind’s biting slices out of my nose and ears – or that’s how it feels. Plus, I left my gloves in the car. Five minutes’ exposure and my hands are already numb. A glance at my watch shows we’re nearing the lunching hour. Reprieved, we slither down the hill, hop into our clean white car. Motoring back to the village of Waddington (60.8 mpg) we have fun trying the ‘B’ drive that brakes our descent as we wind our steep way down. It’s the perennial Yorkshire/Lancashire tussle in miniature, Waddington. In the fifteenth century, Henry VI (house of Lancaster) hid in Waddington Hall for a year after his defeat at the battle of Hexham during the Wars of the Roses. He was captured by the Yorkists in 1464. 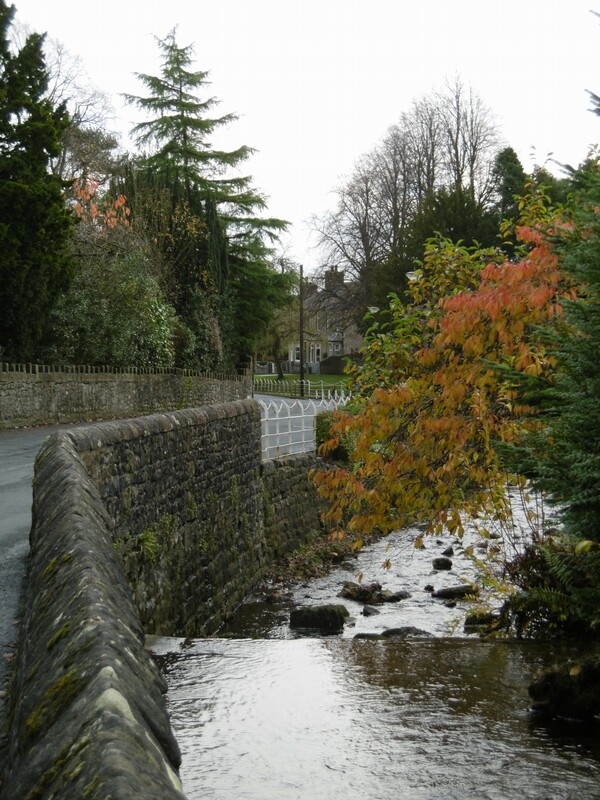 In modern times, until 1974, this Lancashire village was in Yorkshire. Today the Country Kitchen café’s buzzing. Clattering, actually. There must fifteen or twenty of them, the cyclists. All skinny, all in Lycra, all embarrassingly fit for chaps (mostly men) older than me – well, they look it. We shoe-horn ourselves into a tiny table for two and prepare to wait for hours. But, hoorah, they’ve had their tea, their beans on toast – they’re on their way. 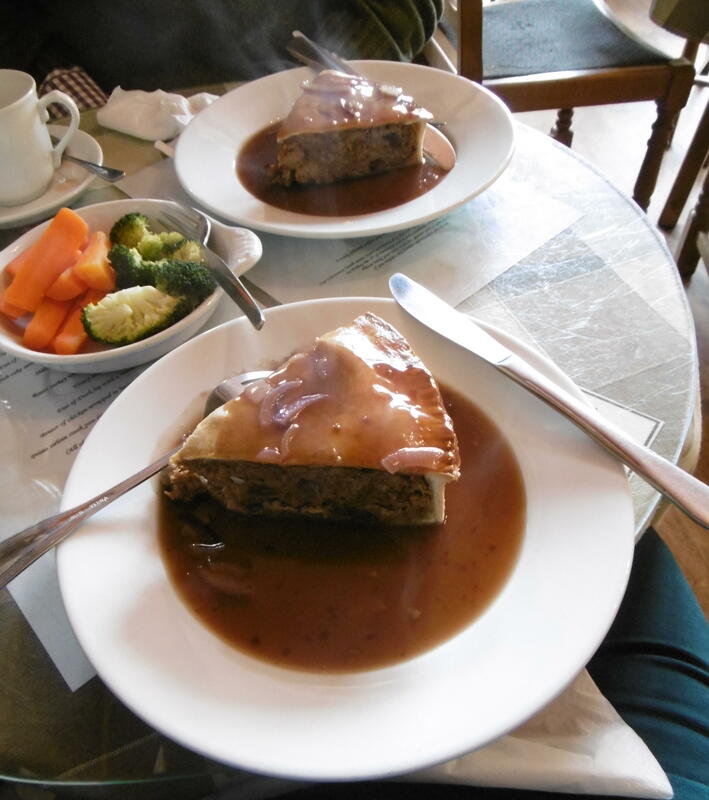 It’s two years since we first sampled the game pie here. Last time it’d run out – we made do with corned beef hotpot and pickled beetroot. The pie’s a treat – only in season when game is in season. I push aside thoughts of the chirpy grouse. They live a carefree life, until they’re shot. Our pot of tea’s half gone by the time the pie arrives, steaming in a puddle of gravy – red wine gravy, says the specials board – with one dish of boiled and mashed potatoes, one of carrots and broccoli. I doubt the Queen’s tried it. But I can’t imagine she’s had better. The man in charge, a cheery soul, isn’t here today, but six Lancashire lasses scurry to and fro. In a café seating 35, that’s very good service. Anyway. I asked the boss what the pie’s secret was, its filling all stuck together, but not with gravy. It’s no longer a secret: sausage meat and egg white. This pie’s the food of the northern gods, believe me. A winter’s day, a cup of tea, tasty chunks of game with seasoned sausage meat. In pastry. Yumph. More than half the potatoes are left untouched. No room for jam roly-poly, nor baked egg custard. No energy left for another wintry walk. We sneak away from the hills and valleys and streams and copses, heavier and happy. 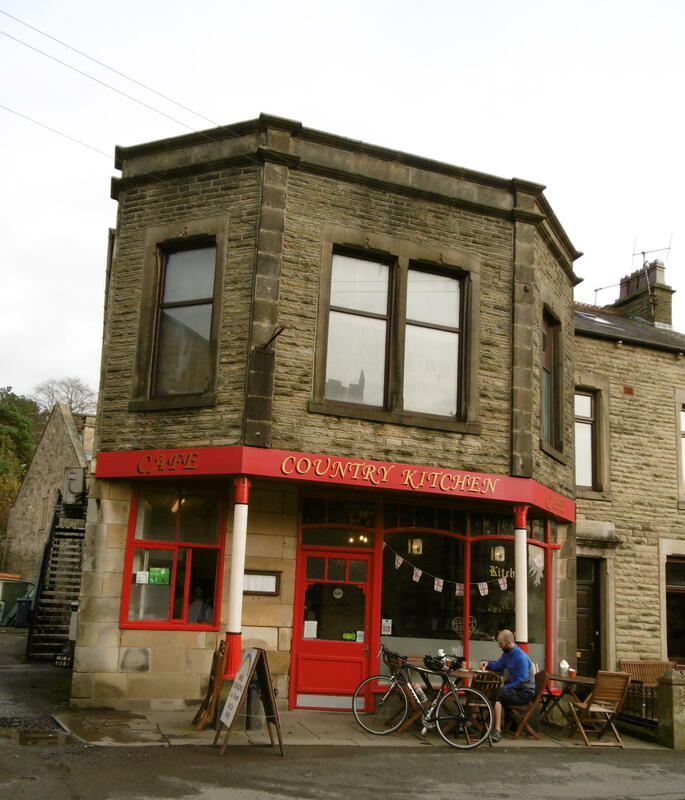 Wend our way through Clitheroe – a small town overlooked by a small castle – and homewards. Ooh, 62.8 mpg – and rising. As dusk creeps in, I wonder where, in Bowland, the Queen would choose to live. Because that’s what the Queen and I have in common. It’s said that someone asked her where in her kingdom she’d retire to if she had the choice. If it’s good enough for her majesty, who am I to disagree? And if she should feel a little hungry, out walking the royal Corgis, she could always try our café. Because there’s a notice in the window. This entry was posted in Art, jaunts & going out, Britain now & then, Lancashire & the golf coast and tagged Area of Outstanding Natural Beauty, Chorley cakes, corgis, Country Kitchen, Eccles cakes, England, Forest of Bowland, game pie, grouse, Queen Elizabeth II, Waddington. Bookmark the permalink. Love it ,would go and live there too if all my life was in Suffolk ! !Liz or should I say Elizabeth !! Your car sounds a little miracle !! My family are great ones for naming cars but I’ve never had a car that’s inspired me to do so. My favourite was Dad’s blue 1960’s Toyota Corona, the “Blue Bomber”. My sister currently drives Harris the Yaris. Affection for Bowland is a nice commanlity with the Queen. Preferable I think to having servants underfoot and many other things royal life would entail. My mum (my dad didn’t drive) always called our cars Fritzi for some reason I will never now know! I love home made Scotch eggs but haven’t had one since my mum died having never made them myself.I also love sausages – have recently found some 97% pork ones and they are the tastiest. One of my favourite meals is sausages, mash and red cabbage cooked with onion and apple mmmmmm. Now I have to go eat an apple! Thanks for reading me Ella! I had never heard of Chorley cakes before this post, but anything with currants sounds delicious! Would the plural of the Latin “foris” be forum, as in a public place? Or is that an entirely separate word? Plural of foris would I think (ahem, may be wrong here, has been a long time!) fores. Forum is a singular separate word and its plural is fora. But more importantly, Chorley cake. It’s a pale, round slab, that’s neither a biscuit nor a cake, basically pastry in which some currants are embedded. It’s take a long walk, out in the cold countryside and have with a mug of tea stuff! And even better with butter on it… Eccles cakes are same shape but the currants are all in a buttery, sugary pocket inside rather than embedded. Both good Lancashire stodge more suited to hard manual labour than namby pamby desk workers like me! Heh. Heh. So it looks like I’ll have to do manual labor to earn some of that Chorley cake….Thanks for clarifying the “foris” vs. “forum” issue!